At a renaming ceremony in his name of the international airport in Harare on Thursday, Zimbabwean president Robert Mugabe said: “It is indeed a great honour for me and I’m humbled by this gesture.” The renaming came amid a week of political activity, with Mugabe wielding the axe against his right-hand man, Emmerson Mnagagwa, and the ruling party paving the way for his wife Grace to replace him. By SALLY NYAKANYANGA. The Harare International Airport has been renamed after Zimbabwean President Robert Mugabe during an official ceremony held in Harare on Thursday. 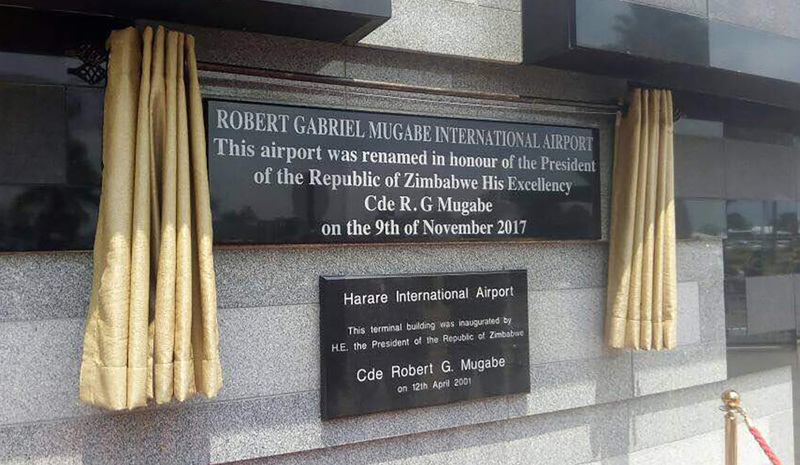 The government has so far gobbled up $500 000 to fund the process of renaming of the airport to the Robert Gabriel Mugabe International Airport, including $300 000 paid to the surveyor general’s office, while the remainder funded the official renaming ceremony. Gumbo highlighted that this will see the Robert Mugabe International Airport undergoing rehabilitation and development. “This includes the construction of three additional aero bridges, a new fire station, a modern terminal building and a new Very Very Important People (VVIP) pavilion. He cited that negotiations for the financing of the project are nearing completion and expected to commence by the end of the year. A Chinese company, China Jiangsu International, has been contracted to do the work. Michael Chideme, the public relations officer for Harare City Council said, this is not something new in the world as we have seen airport named after JF Kennedy, Kenneth Kaunda. “We are hoping it will bring the much needed investment in the country, Chideme added. Meanwhile, the ruling party ZANU-PF’s supreme decision-making body, the politburo, met on Wednesday and reached a decision to expel Emmerson Mnagagwa, the former Vice President of Zimbabwe, from the party. This comes barely two day after he was fired from government. A five page letter attributed to him yesterday cited how he had been unfairly treated despite his loyalty to Mugabe for more than 40 years. Former Bulawayo (second largest city in Zimbabwe) provincial youth leader Magura Charumbira was also dismissed for masterminding the booing of Grace Mugabe at a controversial Youth Interface rally held over the weekend. Further, the ZANU-PF disciplinary committee is expected to deal with several remaining Mnangagwa’s allies. Photo: The plaque is unveiled at the international airport in Harare. Photo: Sally Nyakanyanga.